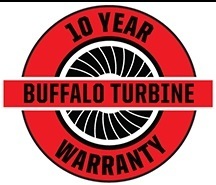 Buffalo Turbine products are now backed by a 10-year warranty! As the industry leader, Buffalo Turbine continues to innovate while staying steadfast on creating durable, long-lasting products. Buffalo Turbine plans to have their products far outlast anyone else.